If you have any questions about the OCEAN 7 information page below please contact us. This impressive luxury yacht OCEAN 7 is a motor yacht. 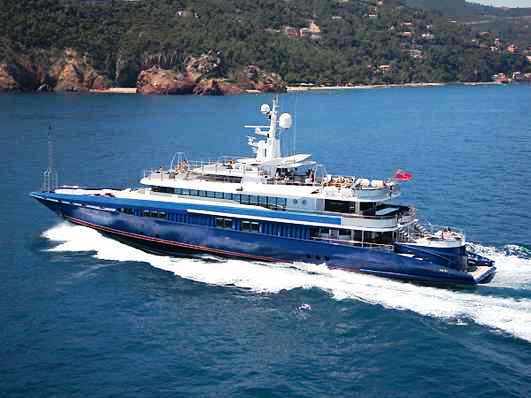 This 54 m (176 foot) luxury yacht was made by Oceanfast (Austal) in 1994. OCEAN 7 is ex Oceana C; Kremlin Princess; Merlin; Little Sis; Bakhshish. Superyacht OCEAN 7 is a stately yacht that can accommodate as many as 12 people on board and has a total of 12 professional crew. Christened for 1994 her internal styling reveals the stately ambience which are originating from Bannenberg Designs Ltd and the owner who commissioned the yacht. M/Y OCEAN 7 (previously Oceana C, Kremlin Princes, Merlin, Little Sis, Bakhshish) was built in 1994 and had an extensive refit in 2008. During the refit, extra deck space was created in front, and on top of the panoramic observation lounge. She offers accommodation for 12 guests in six cabins. The yacht's general design work came from Phil Curran and Bannenberg Designs Ltd. The technical naval architecture drawings are a products of Phil Curran. Motor Yacht OCEAN 7 received her elegant interior designing from the interior design skills of Bannenberg Designs Ltd. In 1994 she was actually launched to triumph in Fremantle and post sea trials and finishing touches was afterwards handed over to the owner. Oceanfast (Austal) completed their new build motor yacht in Australia. A spacious feeling is manifested with a maximum beam (width) of 10 m / 32.8 ft. With a 2.35m (7.7ft) draught (maximum depth) she is fairly shallow. The material aluminium was used in the building of the hull of the motor yacht. Her superstructure over the hull is created out of aluminiumandgrp. In 2008 further refit work and updating was additionally finished. This boat makes use of twin responsive MTU main engine(s) and can manage a exhilarative top end continuous speed of 22 knots. The main engine of the ship generates 2680 horse power (or 1972 kilowatts). Her total HP is 5360 HP and her total Kilowatts are 3944. Coupled to the OCEAN 7 engines are twin screw propellers. For stabalisers she utilises Koopnautic. With respect to thrusters she utilises Schottel. This yacht’s spirited cruise speed is 18 knots which enables a range of 3500. 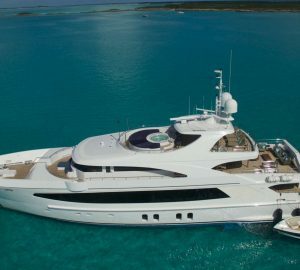 The impressive luxury yacht M/Y OCEAN 7 can accommodate as many as 12 passengers and 12 crew. Her Engine(s) is two 2680 HP or 1972 Kilowatts MTU. The Model type is 16V 396 TE84 diesel. Giving the combined power of 5360 HP /3944 KW. Mtu 2 times 140 kilowatts. Heinen & Hopman is the firm that installed the air-con . She has a teak deck. The luxury yacht OCEAN 7 displayed on this page is merely informational and she is not necessarily available for yacht charter or for sale, nor is she represented or marketed in anyway by CharterWorld. This web page and the superyacht information contained herein is not contractual. All yacht specifications and informations are displayed in good faith but CharterWorld does not warrant or assume any legal liability or responsibility for the current accuracy, completeness, validity, or usefulness of any superyacht information and/or images displayed. All boat information is subject to change without prior notice and may not be current.